A warrior, cleric, and a rogue step into a bar. CI Games announced that Lords of the Fallen is coming to iOS and Android later this week. 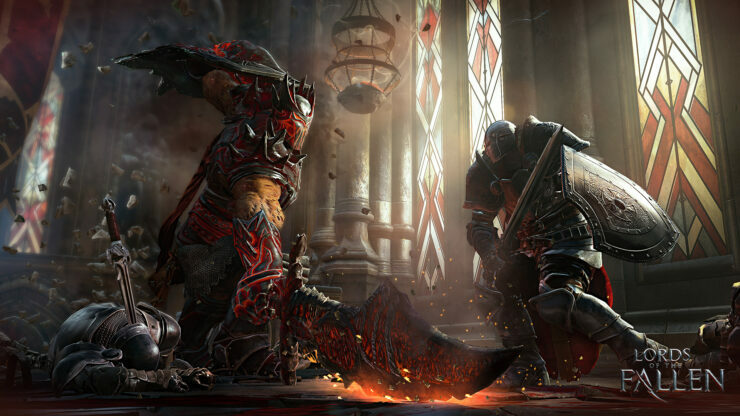 The mobile Lords of the Fallen game is set in the same universe of its console counterpart by the same name. The trio of heroes needs to slay an evil demon queen who’s made a forsaken monastery out of her lair. So, if you want to save the realm, you’ll need to gather yourself and work on your reflexes. This game is brought to you by CI Games, the makers of Sniper Ghost Warrior 3, who recently had an open beta over the weekend. The Sniper Ghost Warrior franchise has sold over 5 million copies for the Polish development team. If you’re familiar with games like Infinite Blade, Lords of the Fallen features 1-on-1 combat against nasty demons by swiping or tapping your screen. Learning to dodge, parry and when to use special abilities will take you a long way and keep you from getting killed. It’s a departure from the Dark Souls-ish gameplay from the console version. The three characters have their own combat style and can be customized with different abilities. Materials you find during your adventure will be used to craft new weapons, armor, and amulets. Lords of the Fallen will be available on the Apple Store and Google Play on February 9th for $9.99. Lords of the Fallen: Complete Edition is out now on Xbox One, Playstation 4, and PC for $19.99.